As rejuvenating winds are sweeping Shimla, tourists from across the country are flocking the hill station for more than just sightseeing. Whether the destination is stress management, deep relaxation or anti-aging, they are attending yoga camps to rediscover tranquility and attain the luxury of true wellness. Well, transcending stress is really not an uphill task. Especially so, when a yoga exponent chooses a mountain resort to combine the romance of bonfire dinners and mid-night treks with the benefits of sound breathing techniques and fluid body movements, amidst the chanting of mantras. So you cannot help but agree when yoga guru Navtej Johar says that the winds of change will sway you off your feet. After that, you’ll be transformed into a whole new being with the help of inhaling and meditation techniques, during the five-day “body and heart yoga retreat” at Shimla. The retreat by Abhyas Trust, beginning from June 25 on 250 acres of peaceful and enchanting luxury camping resort, located just on Shimla’s outskirts, promises to leave you “feeling good” and ready for the world not just physically, but also psychologically. Johar says his techniques are very different from the usual television stuff you are overdosed with. “Yoga requires time to relax, reflect and rejuvenate. You just cannot perform a series of asana for an hour or so daily after sitting in front of the small screen and stake your claim to well-being,” he says. “For complete body and mind healing, you need structured practice in asana, pranayama and meditation, besides chanting and study of patanjali yoga sutras”. As Johar goes on, you realise yoga to him is a holistic practice that conjoins the body, breath and mind to enhance physical, mental and spiritual well-being. He leads you through his techniques into a calming experience that involves positive engagement of mind without reference to, or association with, any religious belief. The fluidity of his art allows him to freely combine yoga asanas with Vedic chanting, along with sound and imagery, to bring about a sense of calm and inner quiet that allows the mind to rise above the “noise” and connect to the self. Just in case you are wondering why Johar chose Camp Potters Hill at Shimla as the venue for the retreat, he explains, “The serenity, pristine environs, and the balmy weather, all combine together to give you the perfect environment to meditate, reflect and relax,” he says. “Looking at the chuckling mountains, you realise the hills are more or less the outward projection of your innermost desire to attain blissful happiness”. Flashing a smile, he says, “Even simple yoga practices become all the more pleasurable and meaningful when sunrays filtering through the windows and tent flaps cajole you awake at 5.15 am each morning. The pleasure continues with post lunch session giving you time for listening to silence in the chirping of exotic birds amidst pine and apple trees. You can even use your newly revived pools of energy for going on treks with a healthy dose of rock climbing! For understanding and experiencing the pleasure of stringing the body and the mind together, you even go through a 45 minute session of Vedic chanting, including the powerful Gayatri mantra. By the end of the session, you pack in nearly 26 hours of yoga practice, interspersed by nature walks and treks to the remote parts of the leafy jungle. So fellows, get going. For the beginners, it will be a comprehensive introduction to the discipline, while those adept in yoga practice will get new insights and learn better techniques to further refine their practice. You have the option of staying in the tents or in a lodge on a twin-share basis. Single occupancy rooms and tents are also available. In case you do not already know, Johar is a yoga exponent whose work has been enriched by his experiences as a renowned Bharatanatyam dancer. A student of the Krishnamacharya Yoga Mandiram (KYM) at Chennai, Johar has been teaching yoga since 1985 in both India and the USA. Firmly grounded in the tradition of Sri Krishnamacharya and Sri Desikachar, Navtej’s yoga focuses on the breath as much as on the physical posture. Navtej founded Studio Abhyas in New Delhi in 2001. A serene place in the bustling capital, the Studio attracts diverse professionals, housewives, senior citizens and children. The Studio offers general and intensive yoga group classes, yoga therapy, Vedic chanting and runs a Yoga Sutra study group. As part of its outreach programs, it offers workshops in schools, colleges and other institutions. Since last year, the Studio has begun offering yoga retreats in the Himalayas, taking its work to places of amazing energy and heightened experience. The long sojourn of a herd of elephants in the state’s Simbalwara sanctuary and the Kalesar National Park in adjoining Haryana over the past year has encouraged wildlife authorities to join forces work to make the tuskers permanent residents. It is unusual to find herds of the giant animal in Haryana and Himachal as the northwestern extreme of the elephant’s habitat extends only up to the Rajaji Park in Uttrakhand. Solitary tuskers did stray into the area occasionally but it was for the first time that a herd of seven elephants stayed put in the area for months together. 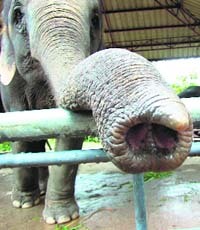 Wildlife authorities are keen to make it a permanent abode of Asian elephants, as it would help extend its natural distribution by about 90 km towards the west. If the herd starts residing permanently, it would be a big achievement at a time when natural habitats of almost all animals are shrinking, says Vinay Tandon, additional principal chief conservator of forests. Also the chief wildlife warden, he has already held a series of meetings with his Haryana counterpart. The Simbalwara Sanctuary and the Kalesar National Park along with the adjoining sanctuary together make available about 100 sq km of compact protected area, enough for a herd. The two states also want to involve Uttrakhand, as the herd will require a safe corridor for movement between the Rajaji Park and the twin sanctuaries. In all, an eight-km corridor in Uttrakhand territory will have to be provided to ensure safe passage to the herd. Wildlife authorities of both states cite this development as an evidence of the successful management of protected areas. Tandon plans to visit Dehradun shortly to discuss the corridor plan with Uttrakhand wildlife authorities after which a joint project will be formulated for funding the project. To begin with, a mechanism for joint management of the two protected areas will be put in place so that the movement of elephants could be closely monitored in a coordinated manner. Other steps to be taken include development of big ponds in the two sanctuaries for the water-loving animal. Tandon feels that once the elephants find the area secure to inhabit, tigers may also start making forays into it. Wildlife authorities maintain that there were seven members in the herd that remained in the region from last July to March. One calf was born during the sojourn in the area. Global Warming? Right now, here above Manali in the upper Beas Valley, it seems as though the new ice age has started! Yesterday was sunny and some of the chill of May dissipated; the night was brilliant with the moon etching the mountains covered by late snow. I had anticipated another sunny day, but the morning dawned with a thick veil of high clouds obscuring the sun. By mid day, a strong wind started blowing down from the Rohtang Pass driving rain before it. It is now chilly and dark though fortunately, the electricity is strong. I have been looking around me to see to what extent I, and I am certain most others, are dependent on this supreme advantage of the very progress it has now become a fashion to deride. Yesterday, the power had failed on our side and we had a blackout right through the night. It was a great lesson in understanding the feelings of the ‘have-nots’ when they look out and see the bright lights of the ‘haves’. While I was going around with a candle, the glow from the lights of the ‘fortunate’ on the other side of the river helped me to understand the driving force of all the frenetic striving to have the bright lights and the comforts that modern technology bestows on mankind. I was reminded of a discussion going on in the warm living room of a neighbour here against a hydroelectric project coming up down the valley. As our host was vehemently expressing his anger at the whole thing, I could not resist letting my eyes stray to the six glowing rods of a heater imported from Italy. There is far too much environment talk going on in homes where lights blaze, and there are the latest of electronic gadgets in the kitchen. Environment issues have to be the concern of those living in tattered shanties and labouring under the harshest of conditions laying roads and striving to lay the infrastructures that provide amenities we all take for granted as our rights. There is a saying attributed to Mahatma Gandhi that ‘the earth has enough for everyone’s needs, but not for anyone’s greed’. As a biologist, this very simplistic sentence annoys me. 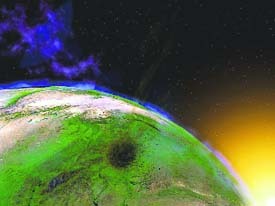 The earth has just so much which, if carefully used, can indeed provide for the needs of many, but what indeed are these ‘needs’? No one ever attempts to define what the basic needs are. Even if only these very basic needs are provided for, there are going to be shortages, thanks to the ever increasing population and a population that is becoming physically and mentally weaker. For the first time in the history of Sirmour parents came on the roads to fight against the poor academic results of government schools and save the future of their wards. This year the performance of the board classes of government schools in the district were shocking with zero or below ten percent results. People agitated against the carelessness, slackness and irresponsible attitude of the highly paid government teachers. The local panchyats too came forward with their complaints against the schools that produced nil or below 20 percent results. Complaints were also filed to the CM’s office and acting on them two teachers have been suspended and show cause notice severed to seven other teachers of Government Senior Secondary School in Koti Dhaman. The school has set a new record in ‘non performance’ by producing nil results in the VII and X classes. In VIII class, all 61 students and in X, all 34 students failed in the examinations. Similar agitations were witnessed at several places in the district. In GSSS Panjahal in Nahan, residents adopted the formula of Gandhigiri and peacefully registered their protest against poor results. The villagers entered the school in a queue and offered a pack of sweets with a five-rupee note on it, to the principal for the school’s achievement in board classes. Only four students passed out of the total 41 in VIII and three out of 46 students in class X.GSSS Jamta in Nahan set an all time low record in its 22-year history, as all the 31 students who appeared in class VIII examination failed. 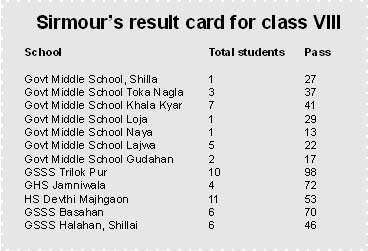 Kamlahad Government High School [GHS] also produced similar results, all 14 students failed in X class, while just two cleared the VIII class examinations. There are many other schools that have produced poor and all time low results in the district. In most of these cases, the local panchyats and people registered their agitations and made complaints to the government demanding immediate action against the teaching staff responsible for the poor results. Paramjeet Singh, deputy director, secondary education, Sirmour said, “This year HP Education Board did not provide the consolidate result of the district as a result we are facing difficulty in assessing the performance of different schools.” He confirmed that his office had received a large number of complaints against the schools and all such representations have been forwarded with the departmental reports to the head office for further action. He further said, “The department is viewing this failure quite seriously and I have written to all schools in the district to submit their complete result card to my office immediately.” He said that strict action would be taken against teaching staff, if it is found that teachers have put their personal interests over and above the welfare of students. Not willing to settle merely for a high profile corporate lawyer life, she wants to delve into anything and everywhere right from painting, sports, modelling and penning poetry. A second-year student of law from NALSAR, University of Law, Hyderabad, 19-year-old Tashi Wangmo caught everybody’s attention with her different looks and sharp and brilliant answers on issues of life. Her confident intelligent and prompt replies in the question round won her applause from all. Hailing from Kinnaur, Tashi was the first runner-up in the recently held Miss Shimla contest at Shimla summer festival. A national level football, basketball and indoor cricket player, she is equally comfortable at the football field as on the ramp. “Modelling for me will always be a side profession and will be more of a stress buster. My ultimate aim in life is to make it as a corporate lawyer,” she says with absolute certainty. She did her schooling from Jesus and Mary Convent, where she topped Shimla in the commerce stream. An excellent debater, later she decided to take up a career in the field of law. Tashi takes out time on and off from her studies to follow her other interests. She has even participated in Miss North India contest and other beauty pageants. She has even penned poetry, which has been published in school and college magazines. “Poetry is perhaps the best form of expression as you give vent to your emotions and feelings,” she says. And she hopes to get her work published some day. A true Buddhist, she is compassionate about animals. “One area of law where I would like to bring about improvement is effective implementation of laws for animals,” she says. Tashi also loves trekking and painting, which have been her passion since childhood. As of now, she is back to her books after her initial brush with glamour. Amrita Sher-Gil is making news again. Her Village Scene was sold for Rs 6.9 crore in New Delhi last March; she was the inspiration for the character of the female painter in Salman Rushdie’s The Moor’s Last Sigh and Navina Sundaram, her niece and a journalist, produced a film Amrita Sher-Gil: The Family Album that recently ran in theatres. Shimla played a pivotal role in Amrita’s life. Her father, Umrao Singh Sher-Gil, was from a Sikh family of Majitha village in Amritsar. He was a Sanskrit and Persian scholar. Her mother, Marie Antoinette, was Hungarian with some Jewish blood and had come to Shimla to charm Umrao Singh, who also happened to be there. This led to their marriage and then the couple went to Budapest where Amrita was born on January 30, 1913. In the March of 1914 came her sister Indira. Amrita had started drawing and watercolours at age five. The Sher-Gil family sailed for India early in 1921 to settle at The Holme at Summer Hill, purchased from a Swedish family and meant ‘island’ in their language. It has a cosy looking outhouse where Amrita did most of her painting and had named it The Studio. Amrita had started learning the piano and violin and at the age of nine had played in a pantomime Pan and the Little Girl at The Gaiety. She was enrolled in a convent school in Shimla but none of the convents today call her alumni because she openly denounced all religious practices using derogatory words against the Roman Catholics. The Mother Superior had expelled her from school! She had a grouse against her parents, too, that they loved Indu more and her less because she was ugly and had a squint. An operation removed her squint and partly restored her confidence in herself. She turned out to be an immensely talented painter and a ‘sizzler, glamorous and promiscuous’ in her youth who had crush on many, including Jawaharlal Nehru. Though it is difficult to gauge the exact nature of their relationship yet they used to exchange letters and Amrita once wrote to him, “You are not hard. You have got a mellow face. I like your face, it is sensitive, sensual and detached at the same time.” In the summer of 1935 when Malcolm Muggeridge of The Statesman reached Shimla, he had a steamy affair with Amrita, whom he found ‘delightful’ in the evenings. In a short span of seven evenings, she had made him a ‘limp rag’. She was famous and her stay in Paris from 1929 to 1934 earned her more fame and she was nominated Associate of the Grand Salon, a rare honour. Returning to India in 1934, she found her real artistic mission to ‘interpret the life of Indians and particularly the poor Indians, pictorially’ because they are ‘strangely beautiful in their ugliness’. Haughty, as she was, she not only rejected a prize given to her by Simla Fine Arts Society in 1935 but also wrote a petulant letter to them. She met art historian and critic Karl Khandalwala in November 1936 in Bombay and discovered the richness and variety of the Rajput and Basholi miniature painters. Then came Ajanta and Ellora. She exclaimed: “Revelations. Ellora magnificent. Ajanta curiously subtle and fascinating — I have for the first time since my return to India learnt something from somebody else’s work.” Her paintings on Hill Men and Hill Women, The Three Sisters etc. and many others are based on the state and its people. It is unfortunate that the State Museum at Shimla does not have any of her paintings. Amrita married her maternal cousin Dr Victor Egan in 1938 and died a mysterious death in Lahore on December 3, 1941 – perhaps of dysentery or peritonitis or a botched abortion. Her mother, too, was also found floating dead in the swimming pool one day and since then the pool at The Holme has been converted into a tennis court and then a park. The national conference DTVC - 2007 organised by the department of electronic and communication engineering (ECE) at NIT, Hamirpur, was an extraordinary event. Many eminent academicians presented their papers on new areas of research in this field. Experts talked about advancements in the field of Very Large Scale Integration (VLSI) and communication. They also pinpointed areas where new research is to be focussed. Dr C.P. Ravi Kumar, senior director, Texas Instruments Limited, Banglore, talked about various aspects of VLSI design, computing, communication and control. He also discussed new technologies and the challenges associated with them. Prof G.S. Visweshwaran from IIT, New Delhi, and Dr Dinesh Sharma from IIT, Mumbai, stressed on the need of research in analog VLSI design. Prof D. Mukhopadhayay from Jadavpur University and Prof I.K. Bhatt, director NIT, Hamirpur highlighted the need for research and development in mono carbon and nano materials for the future. The Society for Environmental and Rural Awakening and Honeybee Network jointly organised a contest for students in IX-XII classes in Kangra district last week. The basic aim behind the contest was to inculcate ecological knowledge among the students and encourage them to learn about the traditional uses of local plants from elders in their family and community. It also seeked to stimulate the interests of the children in the conservation of biological resources of Himachal. of their community and find samples of useful plants. Later, they prepared herbariums with dried samples of the plants mentioning their local names and uses. It was organised with the active support of Margaret Worthington, a Fulbright scholar from Duke University, USA. She is also associated with the Honeybee Network and is presently here for her research on the traditional Indian agricultural practices and biodiversity. Dr Arun Chandan, an ayurvedic doctor and expert on traditional system of medicines, Shivani Dhiman a local student of botany and Minasree Horo, a research scholar from Jharkhand also helped in organising the contest. It is the desire to spend some quiet moments away from the heat and the schedule of daily hectic professional lives that brings in a large number of prominent personalities to Shimla. Be it the daughter of Prime Minister, Dr Manmohan Singh or astute politicians like former Haryana chief minister, Bhajan Lal, they all chose Shimla to spend some time in the beautiful environs of the town. Keen to keep their visit a closely guarded secret, all of them had requested the state government to keep them free from all official engagements. Last week even Delhi chief minister, Sheila Dikshit was here on a brief holiday. As a courtesy call, she did meet her Himachal counterpart, Virbhadra Singh and visited the catchment area too; but she did not get involved in any official engagements. Earlier in the summers, it was Priyanka Gandhi accompanied by husband, Robert Vadera and her two children who spent close to a week at a resort in Mashobra. The Gandhis including the AICC chief, Sonia Gandhi and her son, Rahul are so fond of the place that they have made it a ritual to spend some time here every summer. Being an ideal location for holding seminars and major events in the peak of summers, the state capital was also a host for a meet of parliamentarians and other prominent dignitaries from the SAARC countries. Not to mention the countless film units shooting at beautiful locales like Manali, Kinnaur, Chamba and other places. 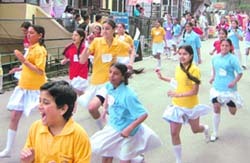 A cross-country run on the theme, ‘Eradication of child labour’ was organised through the main town on the occasion of World Child Labour Day. Students of St Thomas School participated in the run, carrying placards and banners demanding complete banning of child labour. Suman Rawat, joint director, Sports and Youth Services flagged off the run from State Bank of India. More than 350 students participated in the event. The aim of the run was to create awareness among people so that no child has to work and make it a world fit for children. District and Sessions Judge A.S. Jaswal has exhorted women to come forward and take initiative to protect their rights and also to spread awakening among society particularly against destruction of female foeticide. Addressing a one-day seminar organised by the State Legal Aid Services Authority , he said that the authority had been organising such seminars and camps at various places in the state, with a view to spread awakening among all sections of society regarding their rights and privileges. The painstaking restoration and conservation work is no doubt to save one of the most breathtaking and old British time structure, the Gaiety Theatre but the slow pace of work has become a bane for the locals. The worst hit are the locals who are facing great inconvenience due to complete closure of the path along the Gaiety Theatre on the Ridge, which has been completely closed for pedestrians.